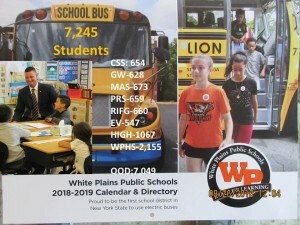 It’s here – another beginning to an exciting school year in the White Plains City School District! We are just about to roll out the buses and welcome over 7,000 White Plains students eager and excited for the first day of school tomorrow September 5th. As you may know, we will be the first school district in New York State to use electric buses, since our bus company has added five of them to its fleet. This is an exciting “first” and it’s fitting that White Plains is leading the way. Additionally, thanks to the overwhelming support of our community during last May’s public vote, we will transport eligible high school students to school at no extra cost for the first time in our district’s outstanding history. We’ve had a busy summer, hiring more than 50 new teachers and improving our physical plant with updates and projects in all of our buildings. All of our cafeterias are now air-conditioned so that students in every building have an area available for relief from the heat. We are very proud to report that summer schools produced 10 additional High School graduates and enhanced the education of hundreds of our younger students. Even during the summer months, our schools are vibrant and busy places of learning! In August, we engaged in a three day Strategic Planning process to update our district priorities and strategies. Sixteen stakeholders, from district and community constituencies, participated in this important process which will help to guide us as we continue to move forward as a learning community. Our annual planning process continued with a two-day retreat for administrators and three days of orientation sessions for new staff members. You will find a link to this on our website, Facebook and Twitter pages later on this afternoon. We hope that you will take a look at it and share it with our community members as well. Five-and ten-minute versions will be available for you to show to your organizations at community meetings. We’d like everyone to be as proud of our schools as we are! Don’t forget about our first home football game of the year – under the lights this Friday night, September 7th, 6 pm, at Loucks Field, against Mount Vernon. Go Tigers! As always, please contact me if you have any questions or comments and don’t forget to follow us on Facebook (facebook.com/wpschools) and Twitter (@drjosephricca and @wpschools).